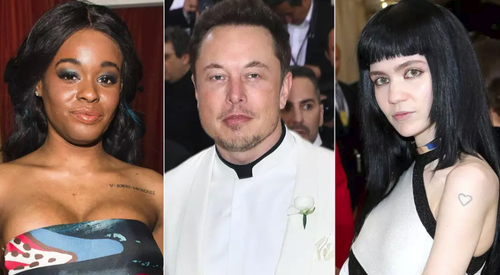 The feud between Elon Musk and Azealia Banks first emerged while Musk was under fire for his famous "funding secured" tweet that later led to him being sued by the SEC for securities fraud. Banks was a guest in Musk's home around the time Musk sent out the Tweet, reportedly invited by Musk's then girlfriend, Grimes. Lately, however, Banks had been relatively quiet about Musk – until last Friday. Shareholders are trying to subpoena Banks as part of a lawsuit against Musk surrounding the "funding secured" fiasco. When Musk's lawyer, Dean Kristy, filed a motion to argue against the subpoena, the contents of the filing set Banks off again. The post has since been deleted. 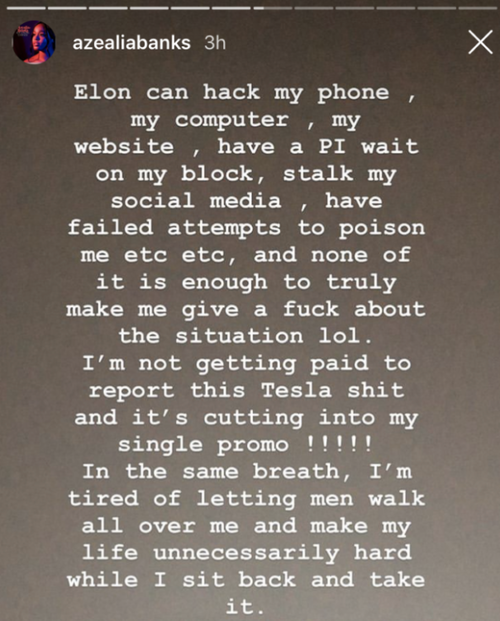 Banks also seemed to allude during a post on Instagram that Musk had hacked her phone, hacked her computer, had a PI follow her and even tried to poison her. Shareholder attorneys are trying to place Banks in Musk's house during the fallout from Musk's famous tweet. 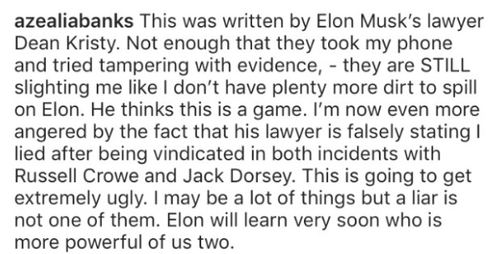 Banks had previously posted in depth about her time staying at Elon‘s home, claiming that while there, Grimes was comforting Musk about “being too stupid not to go on Twitter while on acid”. So naturally, those suing Musk are trying to get subpoenas for all parties involved: Banks, Grimes and even media names that interviewed both of them about their dispute directly after it happened. But Musk's attorneys fired back, stating that "It is evident that this is really more of an effort to sensationalize these proceedings than a legitimate attempt to preserve evidence". They then stated that Banks has a “history of making bold and sometimes unverified claims”. Musk's attorneys also brought up a story about Twitter CEO Jack Dorsey allegedly mailing his shaved beard hairs to Banks, so she could make him an "amulet to protect him from evildoers", prompting amused questions if this is what goes on in the lives of billionaires and the Hollywood elite in California. Citing this story, Musk's lawyers argued that Banks is “...simply not the type of witness, or actual record, that could justify the required finding of exceptional circumstances necessary”. “I’m now even more angered by the fact that his lawyer is falsely stating I lied after being vindicated in both incidents with Russell Crowe and Jack Dorsey,” Banks responded.